Marty Woodfin hugs Life Lion Paramedic Jeff Gewertz during a lunch to thank the first responders who saved her life. When Penn State Children’s Hospital pediatrics nurse Marty Woodfin changed her walking routine from her neighborhood to the medical campus last July, she had no idea that decision would save her life—literally. “It could have so easily been the end of my story that day,” said Woodfin, whose plan was to walk the path around the Penn State Milton S. Hershey Medical Center before going home to nap and work nightshift in the Pediatric Intensive Care Unit. Woodfin, 56, who has no health risks for cardiac arrest, was on the portion of the path that runs along Governor Road when she collapsed in view of passing traffic on Route 322. Lancaster County natives Samantha and Austin Lodish were on their way home to North Carolina that morning and, strangely, their GPS had taken them through Hershey instead of their normal turnpike route. “I saw this woman collapse, and I told my husband, ‘Stop the car!’ It was hot that day, and I thought maybe she collapsed from heat,” said Samantha Lodish, who immediately called 911. “I checked for a pulse and felt none. Instinct kicked in, and I started CPR,” said Austin Lodish, who is an emergency room technician but says he had never been in such a high-intensity situation before. Derry Township Police Sgt. Eric Singiser happened to be three blocks away when the call came in. He was on the scene in less than four minutes, with automated external defibrillator in hand to shock Woodfin’s heart back into rhythm. As the Life Lion EMS crew converged, Woodfin went back into cardiac arrest. They shocked her again and provided needed IVs and medications. Life Lion EMS crew members took Woodfin to the Milton S. Hershey Medical Center’s emergency department and from there, she was admitted to the care of Dr. Annick Haouzi-Judenherc, a cardiologist at Penn State Heart and Vascular Institute. She spent 12 days in the hospital and had an internal defibrillator surgically placed. “It was divine, providential. There’s no question about that,” said Regan Woodfin, Marty’s husband of 22 years. He was supposed to be off work that day but was called in. Had he been at home, the two may have walked together around their neighborhood—and he doesn’t know CPR, he said. In February, Woodfin was able to thank the EMS crew in person and pin Commendation for Lifesaving awards from the Pennsylvania Department of Health onto their uniforms. Marty Woodfin smiles with the police officer and Life Lion EMS team who were part of her chain of survival. From left are Derry Township Police Sgt. Eric Singiser, EMT Robert Snyder, Woodfin, Paramedic Jeff Gewertz and EMT Justin McNaughton. 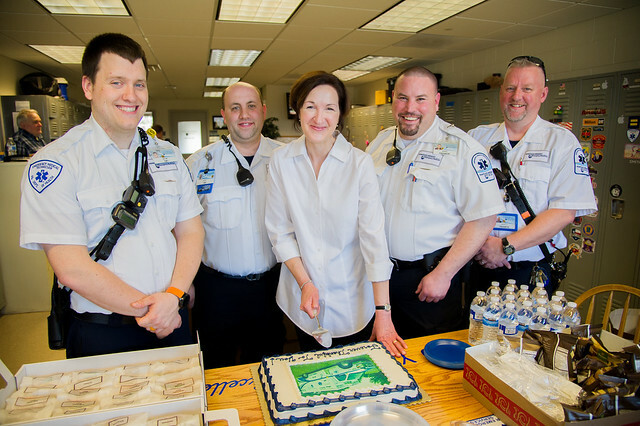 “I can’t think of a better medicine for me today than to get to meet you,” she said, beaming as she hugged each EMS technician. It’s hard to say whose smiles were wider—Woodfin’s or the Life Lion crew members, who also enjoyed a lunch that Woodfin provided. In his 30 years of service, Life Lion paramedic Jeff Gewertz said he had never been honored like that by someone whose life he saved. “I was a little nervous because it’s not often you get to meet the person after you’ve seen them at their worst situation. It’s a good feeling – you’ve saved a life,” he said. “It was good teamwork by all for a good outcome—and that’s what we’re here for,” said EMT Justin McNaughton. Other Life Lion crew members whom Woodfin honored include Scott Sheriff, Bob Snyder, Dan Niedwick and Gwen Wilson. Woodfin says there’s no way to express the gratitude she feels for her second chance at life. “No one really knows why I had a life-threatening cardiac event, but I have to put that aside in my mind,” she said. Recognizing she was under stress from working nights and caring for her elderly mother, she switched jobs and now works days at the Pediatric Specialties Clinic. “Being around life and death as a nurse, I think I already took time to ‘smell the roses,’ but now, if I think of something I want to do for or say to someone, I do it right away because I know I may not have the chance,” she said. Woodfin says she also can’t adequately thank the Lodishes for taking such swift action. Since then, she has met with them twice, and they plan to stay in touch. Marty Woodfin, center, met Samantha and Austin Lodish, the North Carolina couple who stopped to give her CPR, when they returned home for a visit to family in Lancaster County last fall. Are you ready to save a life? Click here to learn where you can learn CPR. Entry filed under: Features. Tags: CPR, Life Lion EMS, patient save. College of Medicine Student Works to Improve Hygiene of Women and Girls in Nepal	Are You Ready to Save a Life?